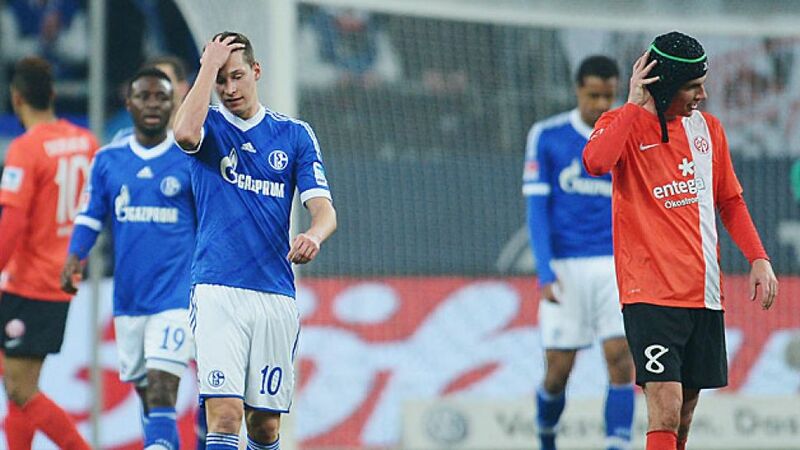 Gelsenkirchen - After four straight wins, FC Schalke 04 had to settle for a disappointing goalless draw at home to 1. FSV Mainz 05 on Friday night. Without taking anything away from what was an impressive tactical display by Mainz, who could have walked away with all three points without anybody protesting, the Royal Blues did not seem quite at the races at the Veltins Arena. Wednesday night's visit of Real Madrid CF in the last 16 of the UEFA Champions League may well be one explanation for why Schalke failed to take maximum points for the first time in 2014. "We're all really looking forward to it," admitted Julian Draxler, who marked his return from injury with a short appearance against Mainz. "Of course I'm delighted to have got back onto the field," said the Germany attacker, whose last game was in the Champions League clash with FC Basel 1893 in December. "I still think I'm a bit short of my best form. This was the longest break in my career, which is why I'm a bit impatient, although at the same time I know that I need a bit more time." That next game, indeed. A taboo subject before kick-off, but a priority afterwards. "Our focus was purely and totally on Mainz ahead of the whistle," insisted Leon Goretzka. "We didn't waste any thoughts on Real Madrid. Only now are we focusing on that next game, and looking forward to a highlight in the Champions League. We'll do all we can to create an upset." That was the role Mainz were in at the Veltins Arena on Friday, playing it practically to perfection. "I think Mainz played a fantastic game," acknowledged Draxler. "They're very uncomfortable opponents and you could see that for long spells of the game. I think we can live with this point at the end of the day." That point nevertheless made it 13 from the first five league fixtures of the new year. Failing to climb above local rivals Borussia Dortmund, for the night at least, was not such a tragedy. "If you compare what we've done with our first half of the season, then we can be happy," said Roman Neustädter. "Who cares about the streak. Of course we wanted to keep the three points, but we've still picked up 13 points from our first five games of the second half of the season." He too had other things on his mind. "Once we've had a jog on Saturday, we'll prepare for Real," he said. "We're going to need a united team performance and we're going to have to be tactically well-disciplined, but we have quality in attack and we're good for a goal even against Real Madrid." They were not good enough for a goal against Mainz, though, and after their first goalless draw at home since October 2008, that is one thing they must remedy for Wednesday.